A year ago, last spring, Darrel (Creative Director) and I sat down to brainstorm the Kid art direction. 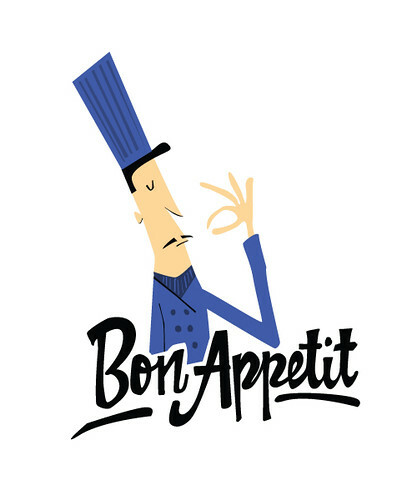 We had already decided on a cooking motif, titled “Bon Appetit.” (For you CentriKid Trivia lovers out there, for a while it was going to be “Taste and See.” “Dig In” was another option, but we finally went with “Bon Appetit”). Darrel had found an artist named Derek Yaniger that had a very distinct style. This style is not unique to Derek, though. Jim Flora was an artist (1914-1998) known for his jazz and classical album covers. He also did children’s books and illustrated for magazines. You can see the same feel in the Monsters, Inc title sequence. We decided to stay within that same flavor (no pun intended). I was one of those weird kids that always knew that I wanted to be an artist. Hey, I spent all my birthday money when I turned 10 on Disney’s Art of Animation, from Mickey Mouse to Beauty and the Beast. I would judge babysitters on their artistic ability. My favorite ones would sit and draw with me. My mom talked about how you could always entertain me at a resteraunt by giving me a pen and a piece of paper. I believe that when God created us, he placed a part of himself in everyone. “Then God said, “Let us make man in our image, in our likeness…” (Genesis 1:26) It’s the Imago Deo. We each have a diffrent piece and it’s only when everyone gets together that we should look even more like Him. My piece? I’m a creator, a builder. One of my favorite stories in the Bible is the creation story. Creating something out of nothing. But, it doesn’t end there. The entire Bible, our lives even, are all stories of God molding us and making us. The book of Isaiah talks about the potter and the clay. Jesus was a carpenter. Priscilla and Aquala, tent makers. Can I do it? I think that’s every creative’s secret fear. Can I do it? Will my last idea be just that, my last idea. For me, it’s that insecurity, that “thorn” that forces me to literally pray everyday for inspiration, to ask the author of the universe to inspire me, grant me the ability to create something today. So, like the boy with only five loaves and two fish, I ask God to multiply my efforts to the point where I have basketfuls left over. The pieces that I work on that people enjoy and appreciate the most are the ones that I’ve prayed over the most. That’s not a coincidence. So, just like any other project, I asked myself “Can I do this?” I wouldn’t categorize myself as an Illustrator. We were curious if we would need to hire a freelancer. I began to do some tests. The blue lady was the first thing I drew. She actually made it to the Camper Devotional book, but I flipped her in the final piece. The chef was my next attempt. He never made it. The third and final charaacter test I did was a food critic. 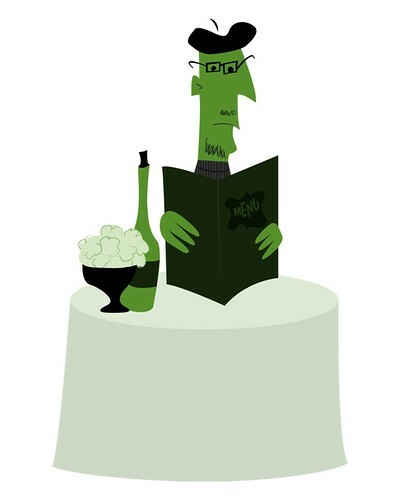 This character also made it into the camper devotional book, except in blue and sans wine bottle. Last fall, I designed the CentriKid website. When we had designed the logo, a year ago, last spring, we determined our main color would be orange. When, I designed the site, Darrel and I decided that each section would have a different background color. I developed the other 3 colors based on the orange. —For the non graphic designers out there, that means that I needed to find colors that would compliment the orange. No clashing here! Since we were really trying to reinforce the new CentriKid look, we decided to use the same colors with the theme. —And actually, we’re planning on allowing these colors to make another appearance next year with Shipwreck Island. For the logo, I always knew I wanted the type to be in a script. I began looking at different fonts online and hand letting different options. 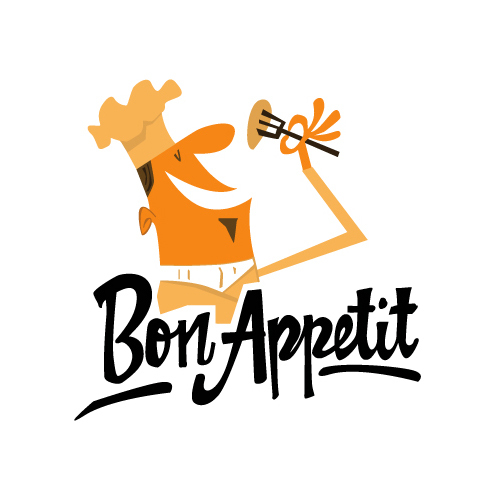 I ended up pulling some of my favorite letters together and creating what eventually became Bon Appetit. Then, it became the issue of adding the character. I started drawing different options. This was the first one. But, we decided the man made the overall shape too tall. The work did not go wasted, though. He made an appearance inside the camper devotional book. The next option was the one that we finally landed on. I think it’s a good case in point: never go with your first idea unless you’ve explored several other options. Nine times out of ten, your next idea will be better than the first. I really enjoy reading these posts about the processes you use while designing the various projects. I don’t think my team thinks about design much, but almost everything we do is operationally focused, so our users don’t care either! One thing I am curious about is how you identify matching colors. With the Centrikid orange, how did you choose the shades of green, blue, and pink to match it? The last thing that struck me was how you’ve identified that your successful pieces are the result of letting God direct your efforts. Do you think that’s something that would happen as frequently or naturally if you were working at a company with a different purpose than Lifeway? For me, most of my prayers regarding work have to do with dealing with co-workers that frustrate me. @Steven Thanks for your comment! I love that you’re reading my blog. I would assume your team still takes a creative approach, just different than what most would expect. It’s all logic based, but there’s creativity involved in that. To answer your question about matching colors, I cheat a little bit. Sometimes I’ll look at a site like http://kuler.adobe.com/ That’s actually how I landed on a palette for this site. For the CentriKid art, though, we decided on orange when we created the logo. There’s a feature in Illustrator where you can select a color and then go to Palette > Color Guide. It will mathematically create different palettes for you: triads, monochromatic, etc. I use that to make sure that my color choices are exact. As far as working at LifeWay, there is always the reminder that we are working for a ministry and a business. Different people walk that line in different ways and on different sides. But, I remember even praying while I painted in art class in high school, so I don’t think it’s just LifeWay that’s pulled that out. Even when I’m working on freelance projects, I pray while I code. Usually it I’m having trouble figuring out how a section works or I know I’m missing a typo, I’ll pray that God will open my eyes to see the problem. It’s amazing how much faster I’ll find the error after I pray that one sentence prayer.